- NEW PHOTO CATEGORY -- What SHOEs eat... We want to see the insides of your fridge ;-) Are you into Junk Food or prefer the healthy stuff? Is it bursting full or is it time for another trip down the shops? 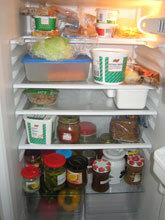 What does the inside of your fridge look like? Is it bursting full or has everything gone mouldy? Perhaps you much rather show us what you are making out of the ingredients of your fridge. What's cooking? What's in your oven right now? We want to know!! !